What are your plans for 2016? Saving money on car insurance? Losing weight? Finally paying off that car? The start of a new year is filled with hope and expectation, but if there’s one thing you learn in the auto insurance industry, it’s that you can’t plan everything. Sometimes the world takes you by surprise, and if you’re not in control, it can throw you for a loop. Driving is the same way – you can’t predict what the conditions will be like with complete accuracy, and you certainly can’t predict an accident. What you can do, however, is work to prevent accidents, and we have a challenge for all of our readers: Make 2016 your safest year of driving yet. Most New Year’s resolutions are about getting rid of your old, destructive habits and replacing them with healthier, safer habits. Driving is no different – you can be a better driver, and the first step to improving your driving ability is identifying your issues. 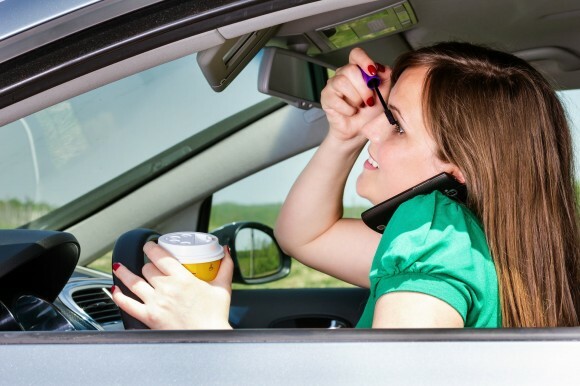 Do you take the occasional phone call behind the wheel? Next time, let it go to voice mail. Have you been multi-tasking on your way to work? Simplify your commute by giving yourself more time to get ready in the morning. Luckily, figuring out what needs work is the hardest part of the process! From there, you just have to pay attention and help yourself avoid those mistakes by replacing bad decisions with suggested alternatives. Let’s use fatigue as an example since it’s so ubiquitous. A driver trying to overcome habitual fatigued driving would first need to identify their issue by paying attention to their driving habits more carefully. After realizing the root of the issue, the driver might more carefully consider driving, deciding to stay in for the night if they’re already drowsy. Even on-the-road, this driver could use their awareness of their problem to decrease their risk factors. If our theoretical driver started nodding off mid-commute, they might consider pulling over and grabbing a cup of coffee. Looking for New York car insurance that can save you money without letting you down? You’re looking for Freeway Insurance. Call or click today for one-on-one help choosing a policy that fits you. Distracted driving is an epidemic, making roads across the country unsafe and causing collision after collision. Even with a hands-free setup, your brain is occupied with the conversation while it should be focused on the road, and that lack of concentration has consequences. If you get a text or a phone call while you’re on the road, let it go to voice mail or reply later – full stop. Have your own driving tips for drivers excited for 2016? Leave them in the comments section below and keep this guide going – it might just save a life. Be sure to visit us online, stop by our offices, or give us a call today. If you’re shopping for auto insurance, New York is a hard place to shop. Let us make it easier with one-on-one help and affordable policies.